FL doctors treating the underserved or themselves? Inside her Fort Myers medical office, Dr. Maryam Nabavi offers patients a menu of med spa treatments aimed at reducing the signs of aging. But when we met with her in the parking lot, she wasn't eager to speak with us. Known as 'area of critical need,' it's a temporary medical license granted to Florida doctors who don't qualify for a regular license but allows them the opportunity to practice only in locations, the state has determined, has a shortage of doctors and a medically underserved population. Katie Lagrone explains what an ACN (Area of Critical Need) license is. Right now, nearly 750 Florida doctors hold a temporary license to practice in an area of critical need. Dr. Maryam Nabavi is one of them so is Dr. Josefina Lozano. State records show Dr. Lozano offers 'area of critical need' medical care at an approved area of critical need medical office in South Miami. But inside, we discovered that medical care is a full blown med spa with services ranging from a $160 laser hair removal session to a $700 MD peel. 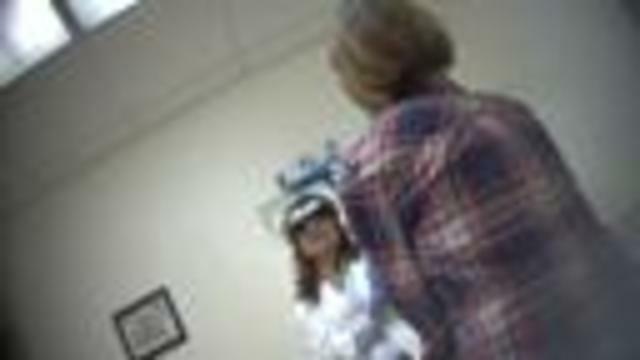 With a hidden camera and $40, Investigative Report Katie LaGrone heard her pitch on botox. Moments later, we spoke with Dr. Lozano in the parking lot of her office. "Are you allowed to perform non-critical type of procedures," asked LaGrone. "It's not critical in the sense that it's an emergency," she responded. "It's critical in the sense that you're helping people underserved," she said. "Like the underserved who need botox?" asked LaGrone. "No, but the underserved who need medical care," she said. Turns out, she's right. According to Florida's Department of Health which oversees the rules on area of critical need (ACN), ACN doctors are not limited in the kinds of procedures they offer, just as long as it's in a state-designated area of critical need, which Lozano's med spa is. Health Professional Shortage Areas (HPSAs) are designated by HRSA as having shortages of primary care, dental or mental health providers and may be geographic (a county or service area), population (e.g. low income or Medicaid eligible) or facilities (e.g. federally qualified health center). Medically Underserved Areas/Populations are designated by HRSA as having too few primary care providers, high infant mortality, high poverty, or a high elderly population. 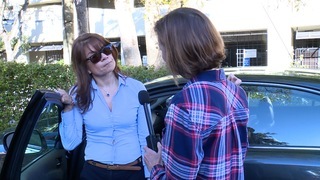 Talking with Dr. Josefina Lozano outside her med spa in Miami, Florida. When asked what would happen if a patient had an issue resulting from a cosmetic procedure, Dr. Lozano who earned her medical degree from the Universidad Autonoma de Guadalajara in Mexico, replied "Why do you think there will be an issue?" 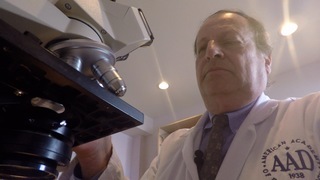 "Well, plenty of things can go wrong," said Dr. Steven Rosenberg who serves on Florida's Board of Medicine. We showed Dr. Rosenberg video from our visit to Dr. Lozano's med spa and her menu of med spa services. Showing our findings to Dr. Steven Rosenberg of the Florida Board of Medicine. "That's pretty scary that all these things are being provided and obviously not medically necessary," he said. Dr. Rosenberg believes Florida's area of critical need law and map are in need of a facelift. "The problem is two-fold," he said. "How do you define medically necessary care which is what they should be providing. Then the other is what areas really have a shortage of physicians." Dr. Steven Rosenberg explains what "Areas of Critical Need" are and how the law works. Or, as we discovered, no shortage at all! According to the state, Dr. Maryam Nabavi is approved to provide 'area of critical need' care at the Charlotte County Jail in Punta Gorda. But we found her at a med spa in Fort Myers, 30 miles south of the jail in a medical park that is not a designated area of critical need. Equipped with a hidden camera, reporter Katie LaGrone went inside and captured images of Dr. Nabavi's wall of fame. 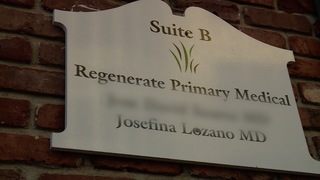 She has been the topic of several local articles touting her stem cell therapy to reduce fine lines and wrinkles. LaGrone took part in a free consultation where Dr. Nabavi pitched the pros and cons of stem cell therapy and botox treatments to help reduce the signs of aging. Nabavi consults Katie LaGrone on the types of procedures she offers at her med spa in Fort Myers, Florida. 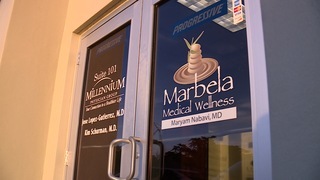 The one-on-one consultation led to a follow up outside where Dr. Nabavi was not interested in talking about how her 'area of critical need' medical license allows her to operate a med spa in a non-area of critical need. "Why do you have a camera?" she asked when we approached her after calling her office for an interview. "You're not supposed to be practicing in an area that's not deemed an area of critical need and you have a med spa," said LaGrone. "We can discuss this later," said Dr. Nabavi who closed her car door and drove off. Repeated calls to her office since that conversation have not been returned. 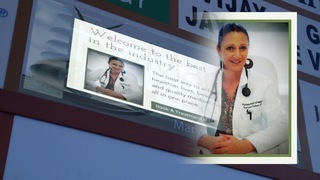 Talking with Dr. Maryam Nabavi outside her med spa in Fort Myers, Florida. 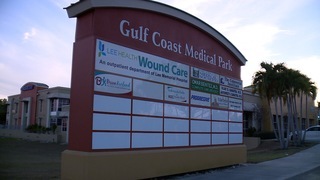 Florida's list of facilities approved as areas of critical need include county health departments, correctional facilities, Department of Veteran's Affairs' clinics, or community health centers. We showed Dr. Rosenberg our findings. Katie LaGrone showing West Palm Beach Dermatologist Dr.Steven Rosenberg of our findings. Dr. Rosenberg serves on Florida's Board of Medicine. "If she's working at a location that was not approved to be an area of critical need, that would be considered illegal," he told us as a board of medicine member. "We are trying to do our best to help people," said Dr. Lozano. Even if the so-called help is anything but critical. Over the past few years, a half dozen ACN-licensed doctors have been disciplined by the state, only a few were for practicing in non-area of critical need areas. Without a policing authority, Dr. Rosenberg fears the issue is more widespread. After watching our findings, Dr. Rosenberg will be bringing up the issue during a Board of Medicine committee meeting February 1 in Orlando. Got a tip? A state issue everyone should know about? Contact our State Investigative Reporter Katie Lagrone above.